A “single-pass” radiator features the inlet and outlet on opposite sides of the core. The coolant flows through the core, making a single pass from inlet to outlet. A dual-pass design allows coolant to travel across the top half of the radiator on its first pass, and then moves coolant across the lower area of the radiator for the second pass. Dual-pass radiators will feature the inlet and outlet positioned on the same side of the radiator. The theory is that heat transfer is improved in a dual-pass design since the coolant moves through at a greater velocity through each half, generating more coolant turbulence. A dual-pass radiator usually provides up to 15 percent more efficiency for the available cooling area. Regarding the number of rows that are present in the core, the rule of thumb is to employ as thick a radiator as you can get away with. However, there are two schools of thought in this regard. On one hand, a thinner core allows easier airflow. As you increase the number of rows, some suggest that the rear rows are then subjected to the heat being released by the front rows during airflow movement. Others suggest that increasing surface area (more rows/thicker core) does more good than harm and, as long as airflow is adequate, it shouldn’t be a problem. I always fit the largest and thickest cores that the application will accommodate, and I’ve never been sorry. If you overkill a bit (of course, when was the last time you had a street rod engine that ran too cool? ), you should be able to rely on the thermostat to regulate coolant temperature. is to have as large a surface area as possible, in as thin a package as possible, depending on cooling demands, and if frontal square footage just isn’t enough, adding more rows and/or increasing the fin count is the answer. If you can get away with it, take advantage of a high fin count, as it creates a greater core density and may be preferred to using a thicker core. Triple pass radiators are now available. 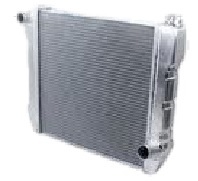 Triple pass radiators circulate coolant across the top portion of the radiator, back across the midsection and through the bottom allowing maximum heat dissipation. These radiator’s offer the same features as our standard aluminum radiators including furnace brazed tanks, two rows of 1 inch tubes, billet machine filler neck with overflow, standard 1 ¾ inch outlet in a universal inlet designed to accept 1½ inch standard hose, -16 or-20AN fittings. Available in 24”, 26”, 28” and 31” overall widths including tanks.